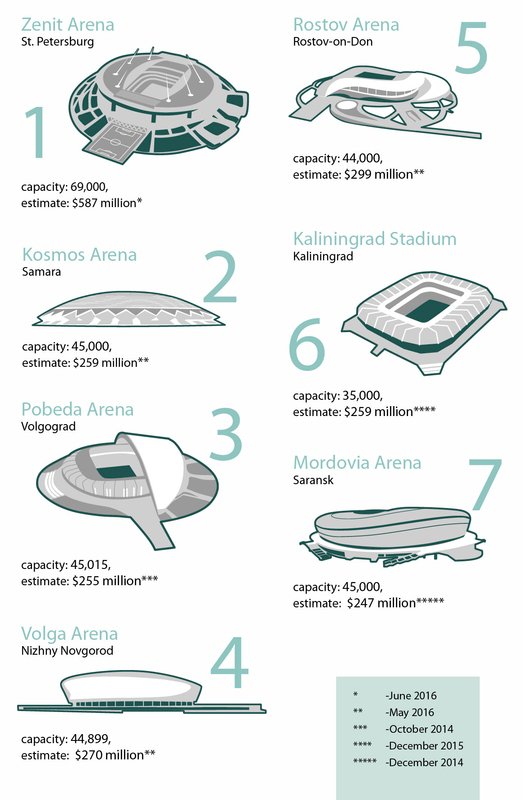 How much is Russia spending on building stadiums for the 2018 World Cup? St. Petersburg's Zenit Arena, a semi-final venue, will cost $587 million. In early June, St. Petersburg authorities announced yet another increase in the estimates for the construction of one of Russia's flagship 2018 World Cup stadiums – the Zenit Arena. The stadium, which will host one of the semi-finals of the tournament, will now cost the Russian budget 39.2 billion rubles ($587 million). The indoor stadium with a retractable field, a sliding roof and a capacity of 68,000 has been under construction since 2006. Over 10 years, the estimated cost of the Zenit Arena has increased by more than six times. When complete, the Zenit Arena will be one of the world's most expensive football stadiums, surpassing, for example, venues such as the Emirates Stadium in London (£470 million) and the Allianz Arena in Munich ($380 million). According to St. Petersburg governor Grigory Poltavchenko, the additional expenses are related to a change in security requirements from FIFA and the security forces. The Zenit Arena will become one of the 12 stadiums to host matches of the 2018 World Cup. Two stadiums – the Otkrytiye Arena in Moscow and the Kazan Arena – are already completed, and three more are now being reconstructed (the Fischt in Sochi, the Central Stadium in Yekaterinburg and the Luzhniki in Moscow). The remaining seven, including the Zenit Arena, are being built from scratch. Here are estimates of the costs of construction for these stadiums.